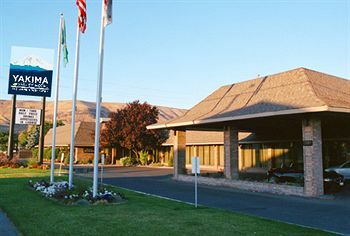 Greater Yakima Girls Softball Association: Preferred Hotels etc. OTHER LINKS UNDER THE HOTEL LINKS! Please make sure to tell the hotel, upon making reservations and when you check in, that you are participating in a GYGSA tournament. 14 Minutes and 9 miles to Carlon Park! "Exceptional has never been so affordable"
10 minutes and 5.62 miles to Carlon Park! 10 minutes and 5.54 miles to Carlon Park! 11 minutes and 6.15 miles to Carlon Park! Conveniently located off I-82 in Yakima, just minutes from Carlon Park. With specially-discounted rates available for GYGSA players & fans. 11 minutes and 5.91 miles to Carlon Park! Selah's New North Park Lodge! Click on the logo to book one of our 54 rooms or call 509-698-6000. In the rooms are refrigerators, microwaves and in room coffee. Our hotel/motel staff is ready to serve you. Our on-site amenities and accommodations will make your family vacation, business trip convenient and relaxing. Choose North Park Lodge as your Selah lodging if you are participating in a Greater Yakima Girls Softball Association Tournament. We are right across the street from the Carlon Park Girls Fast Pitch Premier Softball Complex! Click Here www.northparklodge.com for more information! Get your Sport Supplies Locally!! For Park facilities including Maps/Directions to fields! Would you like to enter the Parade on May 18, 2013? Applications are on line at www.selahdays.org!